In The Book Unbound, scholars and editors examine how best to use new technological tools and new methodologies with artefacts of medieval literature and culture. Taking into consideration English, French, Anglo-Norman, and Latin texts from several periods, the contributors examine and re-evaluate traditional approaches to and conclusions about medieval books and the cultural texts they contain - literary, dramatic, legal, historical, and musical. The essays range from detailed examinations of specific codices to broader theoretical discussions on past and present editorial practices, from the benefits and disadvantages of digital editions versus print editions to the importance of including 'extratextual' material such as variant texts, illustrations, intertexts, and other information about a work's cultural contexts, history, and use. 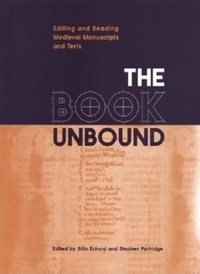 The Book Unbound presents important contributions to the discussions surrounding the editing of medieval texts, including the use of digital technology with historical and literary documents, while offering practical ideas on editing print and hypertext. The collection will be invaluable to historians, literary scholars, and editors.